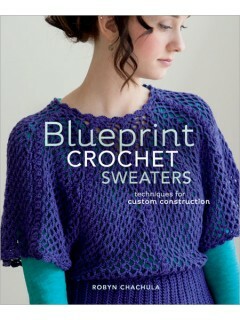 Blueprint Crochet Sweaters by Robyn Chachula is the newest in Robyn’s series of patterns for customized construction for clothing. Most of the patterns are designed by Robyn with one each by Marlaina Bird, Drew Emborsky, Simona Merchant-Dest, and Kristin Omdahl. The book is divided into five sections, patterns with classic construction, top-down and in-the-round construction, granny motif construction, and unique construction, followed by the usual crochet basics for symbol crochet and abbreviations and glossary, followed by notes about the author and contributors and, finally, a resource listing. Each pattern contains a listing of materials, sizes, gauge, notes, special stitches, text instructions, symbol charts, schematics, tips as needed, and photos. Sizes range from extra small to 2X and varies by pattern. The Classic Construction section contains patterns for a cardigan, vest, shrug, and plaid dress. The Granny Motif Construction section contains patterns for a cowl shift, tunic, cropped cardigan, and kimono. The Unique Construction section contains patterns for a car coat, lace tunic, pullover, and v-neck sweater.